Aromatherapy is becoming more widely known and used throughout the world as people become increasingly aware of all the potential benefits they can gain from it. Because of this increased interest in aromatherapy, the popularity of essential oil diffusers (which are an effective and easy-to-use means of utilizing essential oils for aromatherapy purposes) has also increased. But not all oil diffusers are the same; some have extra features and are more complicated to use, while others are more simplistic (and sometimes even portable!). Furthermore, they are all usually sold at different prices. With so much variety in the oil diffuser market, it can be difficult to find one that is suitable for your own needs, especially if you’re just starting out and aren’t sure what qualities to look for in an essential oil diffuser. In order to help you better understand how oil diffusers work in general and what their potential benefits and drawbacks are, we’ve put together this article explaining some of the more important factors regarding oil diffusers and their use. We’ve also included some advice on what to look for when shopping for oil diffusers, as well as our list of the best essential oil diffusers currently available on the market. 2 What is an Essential Oil Diffuser? This essential oil diffuser from the company Pure Enrichment is currently one of the most popular diffusers on the market. It features a sleek and aesthetically appealing design, with no bulky buttons or switches. It is also quite compact, so you won’t need to worry about it taking up too much space in your home or office. Additionally, this diffuser is made of BPA-free plastic. 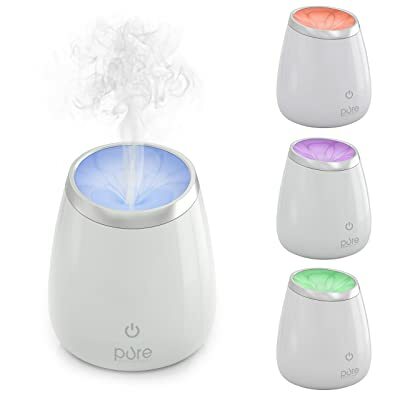 As far as operation goes, the PureSpa diffuser is an ultrasonic diffuser, meaning that it is very quiet and diffuses the essential oils via vibrations within the device. It is also capable of operating for a maximum of ten hours before needing to be refilled with water. One particularly excellent feature that this diffuser possesses is the automatic shutdown; whenever the water level drops too low, the diffuser will automatically turn off for safety reasons. This diffuser also comes bundled with a measuring cup so that you can refill it more easily. One small downside to this particular diffuser is that it must be plugged in to operate; there is no compartment for batteries. Therefore, you will always need to place it somewhere that is close to an electrical outlet. Another downside is that it has no built-in timer or intensity limiter; as a result, you cannot really select how often your diffuser will activate. Overall, this diffuser is a good choice if you want a product that is straightforward and simple, with a sleek design and no excess features. Also from Pure Enrichment, this essential oil diffuser is a more compact version of their larger and more effective diffusers, such as the Deluxe version we discussed a moment ago. This oil diffuser has a range of up 250 square feet, making it a great choice for smaller rooms. This diffuser is also easy to use; you simply need to fill it with water, add a few drops of your chosen essential oil, and then you’re good to go. This diffuser can run for up to six hours, and like the Deluxe diffuser it has an automatic shutdown feature that will turn off the device if the water level drops too low. It is also very quiet, so you can put it in a work environment without worrying about it making too much noise while it operates. 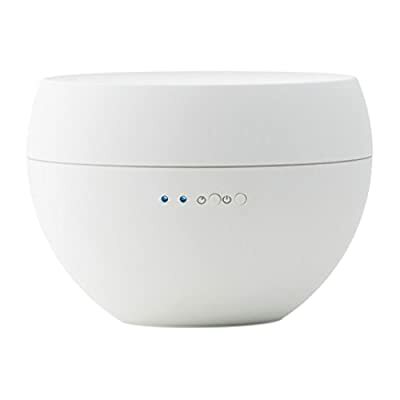 It is also quite affordable for an essential oil diffuser, making it a good choice if you want to try aromatherapy with essential oils but don’t want to spend too much money. 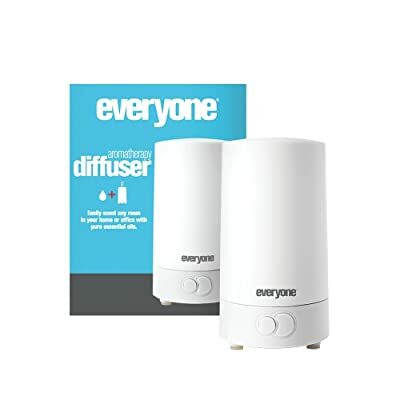 One downside to this diffuser is that it needs to be cleaned every couple weeks, which might start to seem tedious after a long period of time (that being said, it is very straightforward to clean, and the cleaning process shouldn’t take very long if done correctly). It’s also recommended to keep this diffuser on a flat and stable surface at all times in order to keep it from spilling or unbalancing; you will need to carefully select a place where this diffuser will still be effective but also won’t be disturbed or tipped over. All in all, this diffuser is a good choice if you want something that is affordable and good for small spaces. If you want an essential oil diffuser that is both affordable and effective, then the InnoGear diffuser is a good option for you to consider. It’s also a good choice if you want a diffuser that is quiet. 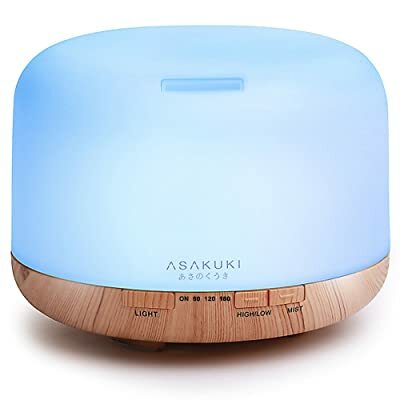 And not only does this diffuser function quietly, it also doubles as a humidifier (which can help to avoid dry and stuffy air in your living spaces, as well as increase your overall respiratory health and help to prevent illness). This particular diffuser also comes with three main modes: continuous mist (where it diffuses constantly), lights only (where it doesn’t diffuse at all and only serves a pleasant decorative light or nightlight), and intermittent mist (where it releases a mist for thirty seconds and then turns off for the next thirty seconds). This diffuser functions with a water tank, making it similar to some of the other diffusers we’ve already discussed. With a full water tank, this diffuser can run for about three hours (if it’s set to mist continuously) or for six hours (if it’s set for intermittent mists). This diffuser also comes with seven different color settings for the light; you can choose from red, dark blue, light blue, green, yellow, white, and pink. Alternatively, there is an option to automatically cycle through a few of the colors instead of selecting only one. This diffuser also comes with a 45-day Money Back Guarantee if you’re not entirely satisfied with the product. It also comes with an eighteen month warranty just in case part of the diffuser turns out to be damaged or defective in some way. One small downside to this diffuser is that while the misting function is primarily quiet and unobtrusive, if it’s in intermittent mode it does make a slightly louder sound when it activates after being idle; therefore, if you want a diffuser that is entirely quiet all the time, this might not be the right choice for you. Overall, this diffuser is a good choice if you want a product that has some very good features while still being affordable. This diffuser from NOW Foods is also an ultrasonic diffuser, but unlike some other brands of ultrasonic diffusers, the water tank can be filled with regular tap water; this sets it apart from other diffusers that often require you to use distilled water specifically. Being able to use any type of water helps to make this diffuser more user-friendly and simple to use. This diffuser is also not just easy to use, but easy to clean and maintain as well. Furthermore, you can use it as soon as you buy it; no frustrating set up is required! You can simply fill it with water, add in your essential oil of choice, and start it up! Furthermore, you only need four ounces of water and a few drops of an essential oil. This diffuser also features enchanting LED lights. These lights can rotate through a selection of colors, be paused on a certain color if you desire it, or be shut off entirely if you prefer to have no excessive light coming from the diffuser. This diffuser also comes with an automatic shutdown feature; if the water level drops too low, it will shut off automatically for safety reasons. That being said, this diffuser is capable of running for a maximum of eight hours continuously, so you will usually be able to start it up without worrying about it running out of water too quickly. One notable downside to this particular diffuser is how often you will need to clean it. The manufacturer recommends cleaning this product once thoroughly for every ten hours of use, so if you have this diffuser in operation constantly you will likely find yourself cleaning it often (perhaps even once or twice every single day), which might become frustrating or tedious long-term. That being said, the actual cleaning process itself is quite easy (you simply wash it with vinegar and water); it’s simply the frequency of cleaning that can be irritating. Overall, this essential oil diffuser is a good choice if you want something that is effective while also easy to use. This product is, as the name implies, designed to be a good choice for everyone, whether you’re experienced with essential oil diffusers or new to the concept. This diffuser is ultrasonic, but also features an internal fan that helps to disperse the essential oil particles throughout the air. It is also very compact and lightweight, making it a great choice if you want a diffuser that you can move from room to room easily. It’s also relatively affordable for the features it provides. Some of these features include four lighting options (warm white light, a rotation of different colors, a color of your choice, or no light at all) and a helpful automatic shut-off feature that causes the diffuser to turn off if the water level drops too low. One downside to this particular diffuser is that it does need to be plugged in to operate; there is no option for battery power. That being said, it can be plugged into either a traditional power outlet or a USB socket, giving you more options for where you can set it up. It is even compact enough for use on the go, provided you have a means of powering it (such as a USB charging outlet in your car). This particular diffuser is small but powerful. Despite being only a few inches across with a small water tank, it can run for up to twenty-four hours (when set to go off at timed intervals) or eight hours (if it runs continuously without pause). In addition to this long activity period, it has a wide range (of approximately 540 feet, which is considerably more distance than other diffusers from competing brands). Additionally, this diffuser is very easy to clean and maintain thanks to its small and compact design. Its petite size and lightweight design also make it very portable; not only can you move it from room to room easily, but you can even take it with you when you travel. It also, like many modern diffusers, comes with an automatic shutdown function for safety reasons that will result in the diffuser turning off when it runs out of water. The only real downside to this diffuser is that it is quite simple when compared to other diffusers; it lacks many of the more complex features (like colored lighting or adjustable mist settings) that some of the more high-end diffusers possess. Overall, this diffuser is an excellent choice if you want an essential oil diffuser that is compact and portable yet still effective at dispersing essential oil particles into the air. 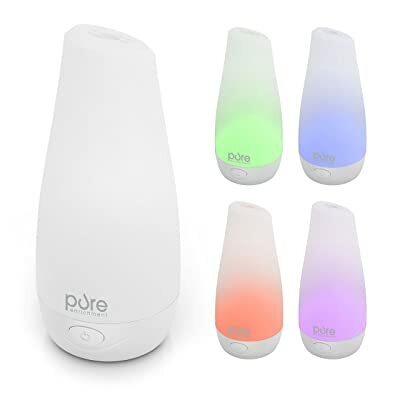 This essential oil diffuser is most widely known for its iconic design and appearance (the honeycomb pattern on the outer shell, which can look quite striking in tandem with the colored lights) along with its overall effectiveness and ease of use. In addition to being easy to use (all functions are controlled with the press of one single button), it also features stylish and fun LED lights that either shift between different colors or remain paused on a color of your choice. And like many other essential oil diffusers, it has an automatic shut-off feature for when the water level gets too low, so as to prevent the device from overheating and becoming a safety hazard. 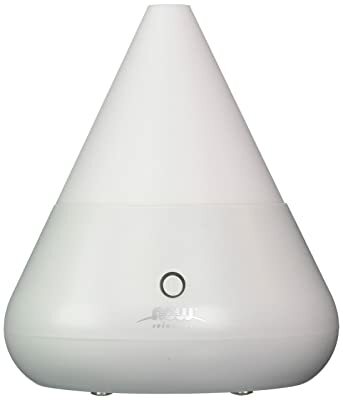 This diffuser also has two modes for essential oil dispersal: continuous mist (which can last for about three and a half hours) or intermittent mist (which can last about seven hours). Also, this diffuser is fairly powerful and quite effective at dispersing essential oil particles throughout an entire room. 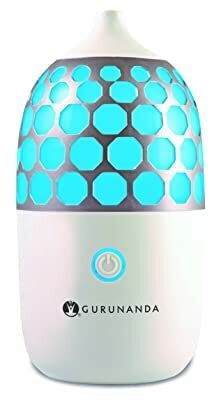 Overall, this diffuser from GuruNanda is a great choice if you want an effective essential oil diffuser that is easy to use while also having a unique and distinctive appearance. 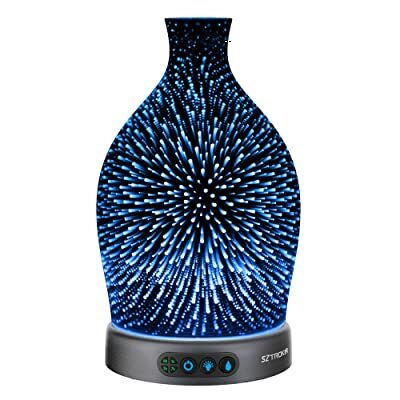 This ultrasonic essential oil diffuser features an even more distinctive design than the GuruNanda Honeycomb diffuser; it resembles a cross between a disco ball and a lava lamp (giving it a sort of futuristic science-fiction aesthetic) and features eight main color options (and each color option in turn comes with the choice to have it be bright, dim, or a medium level of brightness). This unique design also makes it fairly versatile in terms of placement within your living space, since it can be used as a fun decoration (especially in a child or teenager’s bedroom) as well as a functional aromatherapy device. This diffuser is also a great size; with a water tank of 180mL, this diffuser isn’t too small or too large; instead, it’s a reasonable medium-sized oil diffuser that can fit comfortably in all sorts of locations within your home or office. On a full tank of water, this diffuser can run for six hours continuously, or eight hours when set on intermittent mode (which results in the diffuser releasing a mist every ten seconds). This diffuser also features an automatic shut-off for safety purposes; it will activate when the water tank is empty. One notable downside to this particular essential oil diffuser is that it is a bit louder than some other diffusers when it is active. This extra level of white noise might not bother some people, but for those who need a quiet (or silent) oil diffuser it might be a little too much for them. Additionally, the buttons also make audible beeping sounds whenever they are pressed. Overall, this diffuser is a great choice if you want something with a fun and stylish appearance that also functions effectively to disperse essential oils throughout your home. This particular essential oil diffuser has a 500mL water tank, seven lighting options to choose from, and also offers a variety of nebulizer modes. Furthermore, it can function as a humidifier as well as an essential oil diffuser, making it a great choice if you want a diffuser that is more versatile and serves multiple purposes. For duration, it is capable of lasting between ten to sixteen hours depending upon which mist setting you select, making it one of the best essential oil diffusers on the market if your goal is to have a diffuser that can be active for long periods of time. This diffuser is also built with premium grade and eco-friendly materials; all of these materials are also thoroughly tested to ensure quality and safety. This diffuser is also backed by a one-year warranty as well as a six month money-back guarantee, so you can rest assured that if your diffuser malfunctions or is defective in any way the company’s customer service department will strive to resolve the situation for you as expediently as possible. Handmade in Taiwan, this ultrasonic diffuser is designed to be aesthetically pleasing while also maintaining a high level of functionality despite its compact size. Thanks to its sleek and slim design, this diffuser can fit just about anywhere in your home or office, and its basic appearance also helps it to blend in well with any sort of surroundings. Additionally, the reservoir within the diffuser can hold the essential oil of your choice as well as the water, making it more efficient when compared to other brands of essential oil diffusers that have a separate compartment for the essential oils. The buttons for operating this diffuser are also small and discreet; located on the back of the device, they can control the diffuser’s LED lighting mechanism as well as let you choose between the diffuser’s continuous mist setting and intermittent mist setting. On the continuous mist setting, the diffuser can run for about three hours. The intermittent mist setting (which releases a spray once every three minutes) allows the diffuser to run for seven hours, over twice as long. Additionally, this diffuser’s mist can reach distances of up to 538 feet, giving it a much wider range than most other diffusers. 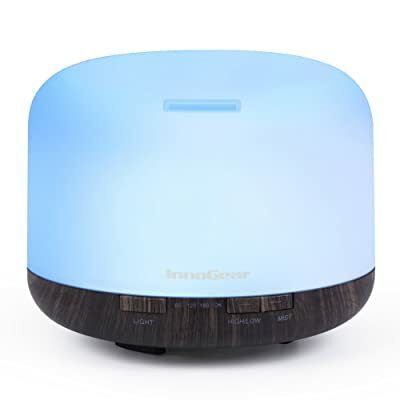 The notable downside about this diffuser is the hefty price tag; it is considerably more expensive than many other essential oil diffusers on the market. An essential oil diffuser is a device that is used to disperse essential oil particles into the air. Essential oil diffusers are considered by many people to be great tools for aromatherapy thanks to how simple to use and effective most of them are; typically all you need to do is fill the diffuser with water, add in a few drops of the essential oil of your choice (different oils have different effects), and turn it on. Next up in this article, we will discuss some of the great benefits you can gain from using essential oil diffusers, as well as some potential drawbacks. We’ll also explain the differences between the various types of essential oil diffusers and tell you how to best use an essential oil diffuser in order to achieve maximum effectiveness. There are many potential benefits that can be gained from using an essential oil diffuser. We’ve listed some of the more prominent ones below. Relaxation – Between the stress of your work and the responsibilities of your life at home, it’s very easy for stress and worry to accumulate. Essential oil diffusers can help with that by giving you a way to utilize various essential oils for easy at-home aromatherapy treatments; some people even put essential oil diffusers in their work offices to create a more relaxed and productive environment. Some essential oils that are quite popular for relaxation are chamomile, lavender, and sage, but there are many other oils (or even combinations of oils) that can be used to produce a calming and relaxing effect. Mood Elevation – Certain essential oils have proven to be effective at improving a person’s mood; some people will put citrus essential oils (such as orange or lemon) into their diffusers if they want to feel happier and more energized, while other people will use other scents such as vanilla, pine, peppermint, or even sandalwood. When it comes to improving your mood, feel free to try a variety of different essential oils to find the one that works best for you. Illness Prevention – Many essential oils also have anti-microbial properties (meaning that they can help ward off bacteria and germs), so using an essential oil diffuser can also help you avoid getting sick! They are especially useful for reducing the impact of airborne pathogens, thanks to the way diffusers disperse the essential oils throughout the air as small particles. Additionally, some essential oils also function as immune boosters, which can help you to be less susceptible to illnesses in the first place. Furthermore, certain types of diffusers (such as ultrasonic and humidifying diffusers) also function as humidifiers, and as such can help keep your lungs healthy and less susceptible to germs and bacteria. Repel Insects – Similar to how citronella candles can help to repel insects, certain essentials oils function the same way. Essential oil diffusers have some notable advantages over citronella candles, however, most notably that no fire is needed and therefore you can set up your diffuser and not have to worry about checking on it for safety reasons. Some of the more effective essential oils for repelling insects are lemongrass, clove, rosemary, and cedarwood. Easier Breathing – The use of certain essential oils in conjunction with essential oil diffusers that double as humidifiers can help people to breathe easier, especially if their airways are inflamed or congested. Depending on the essential oils used, diffusers can also help people with asthma or other breathing disorders since the dispersed oils can help clear out the lungs and sinus passages. Oregano in particular is a popular choice for helping with respiratory issues. Pain Relief – Many essential oils are also used to help manage and relieve pain, whether it’s pain from headaches, overworked muscles, or another sort of physical ailment or injury. Some common essential oils used in diffusers to help with pain relief include (but are not limited to) ginger, eucalyptus, lavender, sage, rosemary, and bergamot. Convenience – Essential oil diffusers are an effective and easy-to-use method for utilizing essential oils due to how little effort is needed for their operation in comparison to other methods. Essentially, all you need to do is set up your diffuser (which in some cases can involve filling the diffuser’s water tank or replenishing the essential oil you’re using) and let it take care of itself. Once you’ve stocked your diffuser with the essential oil (or oils, if you’re using a combination of them) of your choice and set the timer for how often it will activate to disperse the oils, all you need to do is sit back and enjoy the therapeutic experience that your essential oil diffuser will provide. There is really only one main drawback when it comes to buying and using an essential oil diffuser, and that is the financial cost. The majority of high quality diffusers, particularly nebulizer diffusers (which do not require water, heat, or electricity to function), can be fairly expensive. Furthermore, certain types of essential oils (such as jasmine, sandalwood, rose, and frangipani) can be quite expensive as well. That being said, there are options for anyone who wants to purchase an essential oil diffuser on a tight budget. There are smaller and simpler diffusers that are relatively inexpensive when compared to their larger counterparts; these mini-diffusers are typically designed for portability and plug into USB sockets for easy activation. Additionally, there are plenty of essential oils that are cheap and affordable (peppermint, basil, and lavender in particular are considered some of the cheapest essential oils on the market), so if you still want to obtain the therapeutic benefits of essential oils without breaking your bank account, there are ways you can do it. There are four main types of essential oil diffusers: nebulizing diffusers, ultrasonic or humidifying diffusers, evaporative diffusers, and heat diffusers. Nebulizing diffusers are currently the most common and popular essential oil diffuser type for a variety of reasons. The primary reason they are so well-liked is that unlike other oil diffusers that need heat or water to function properly, this diffuser needs neither. Instead, it functions using pressurized air in conjunction with the essential oil of your choice to release a fine mist of fragrance. Many nebulizing diffusers also come with built-in timers, so that you can pick how frequently the essential oil mist is produced. This particular quality is great for aromatherapy purposes, especially in your living space. In general, nebulizing diffusers are considered preferable to other types of diffusers if you’re intending to use essential oils for therapeutic purposes since it doesn’t dilute the essential oil as part of the dispersal process and instead mists particles of pure essential oil into the air for maximum effectiveness. These types of diffusers are similar to nebulizers in that they produce a fine mist of essential oils, but the way they function is ultimately quite different. Instead of the oil being turned into a mist with pressurized air, an ultrasonic diffuser utilizes electronic frequencies. These frequencies cause high speed vibrations. These ultrasonic vibrations cause the oil to break down into smaller particles that are then expelled into the air. Ultrasonic diffusers are said to be more effective than other types of diffusers because this diffusing method allows the small oil particles to be absorbed more effectively by your lungs when you breathe them in. That being said, ultrasonic and humidifying diffusers often require the dilution of the essential oil being used; in most cases, you will only need to use a few drops of essential oil for an entire container of water, and it is this mixture of the two (the oil and the water) that is then dispersed into the air. Therefore, these types of diffusers are a good choice if you want to use small amounts of essential oils while still getting the benefits from their use. Additionally, ultrasonic and humidifying diffusers are good to use combination with fans or air conditioning units, since the fine mist produced by one of these diffusers can be spread through the air quite easily; as a result, if you place your ultrasonic diffusers close to a fan, it will allow you to get a greater range with your diffuser. Some of the best ultrasonic diffusers also come with timers, allowing you to set up specific times for when you would like your diffuser to activate. These diffusers work pretty much the way the name implies: by evaporating the essential oils into the air as they turn from a liquid state into a gaseous state. In comparison to the other three types of diffusers, evaporative diffusers are very simplistic in design and function. Typically, an evaporative diffuser will have some variety of pad, filter, or absorbent stick with essential oils on it (or soaked into it). Then, this pad or filter is placed near a fan that blows air on and around it, increasing the overall speed of evaporation. Evaporative diffusers are popular for their simplicity and affordability (they are almost always significantly cheaper than other types of diffusers that rely more on modern technology), but there are a few downsides. One of the most notable detriments of using an evaporative diffuser is that you will not experience the full effects of your essential oils all at once. This is due to the way evaporation works, with the lighter particles of the oils evaporating into the air before the heavier particles; this means that your oil is basically being broken apart and different aspects of it are being diffused at different times. Therefore, while evaporative diffusers are a cheap and easy means of utilizing essential oils, you may not receive the maximum therapeutic benefits of your essential oils when using them. Heat diffusers work similarly to evaporative diffusers in that their ultimate function is to disperse the essential oils using evaporation. But unlike ordinary evaporative diffusers that rely simply on natural evaporation or air-assisted evaporation, heat diffusers utilize heat to increase evaporation speed instead. Additionally, some heat diffusers have different settings that can impact how quickly or how powerfully the essential oil is diffused. A higher heat setting, for example, can produce a stronger scent from the essential oil, but bear in mind that if the heat level is too high it can actually have an impact on the chemical composition of the oil being used and subsequently also have an impact on how it affects you. Another great benefit to heat diffusers is that they are almost always entirely silent when they operate, making them an excellent choice if you want a diffuser for use in quiet environment. A drawback to heat diffusers is that they need power to operate, so they will need to be placed somewhere in close vicinity to an electrical outlet. Smaller battery-powered heat diffusers do exist, but they tend to be very basic and generally aren’t as effective as battery-powered nebulizing and evaporative diffusers. Choosing the best essential oil diffuser for your own individual needs can be tricky and difficult, especially if you aren’t sure what qualities to pay attention to. In order to help make the process of buying an essential oil diffuser a little bit easier for you, we’ve compiled this quick and easy guide for what to keep in mind when shopping for an essential oil diffuser of your own. Ultimately, there are four key factors to consider when choosing the best essential oil diffuser. Different essential oil diffusers have different coverage areas. Essentially, this is how far the essential oil particles reach when the diffuser is active. Typically, the farther of a range the diffuser has, the better for you. Make sure you buy a diffuser that can cover the entire room it’s in, otherwise the essential oils won’t be as powerful and effective. Some essential oil diffusers require very little in the way of upkeep, while others require more attention and care. Some factors to keep in mind are how often the water tank on your diffuser needs to be refilled, as well as how often it needs to be cleaned. If you find repetitive tasks like refilling a water tank and cleaning the diffuser frequently) frustrating, try to find a diffuser that has a larger water tank (that won’t need to be refilled as often) and a diffuser with a simple and straightforward design (so it won’t need a complex cleaning on a frequent basis). Some essential oil diffusers are very straightforward to use, with an easy set up process and simple controls. In comparison, other diffusers are more complex; they can feature overly complicated timer settings and confusing instructions for how to operate the diffuser itself. Since the main purpose of essential oil diffusers is to use aromatherapy to improve you mood and overall well-being, so it doesn’t make much sense to frustrate yourself in the pursuit of that by buying an essential oil diffuser that it too complicated to use easily. Therefore, it’s important to look for an essential oil diffuser that meets your needs. Don’t opt for a more complex diffuser just because it seems fancier; choose an essential oil diffuser that is both easy to use and effective. How expensive an essential oil diffuser is must also factor into your decision whether or not to buy it, of course. Make sure to buy a diffuser that is within your budget, and also make sure that it is a product with enough features to justify its price. Ultimately, there are many effective essential oil diffusers that can be found at an affordable price, so finding a diffuser that meets your needs without breaking your bank account shouldn’t be impossible. The primary thing to always remember when using an essential oil diffuser is to follow the directions that come with the product. While there are certainly similarities between the various brands of diffusers, each one is designed differently and such as must be operated and cared for differently. Keep Your Diffuser on a Stable Surface – Most diffusers need to be on a flat surface to function properly. Being on an uneven surface can cause the water in the internal water tank to slosh around and spill inside of the device, which can damage it. It’s also possible that the dispersal of the essential oil particles can be impeded or hampered if the diffuser isn’t balanced correctly, which will in turn reduce the overall effectiveness of the oils. And finally, if your diffuser is on an uneven surface, there’s always the chance it could tip over and fall, and subsequently break; since most diffusers aren’t cheap to replace, it’s better to keep it on a flat surface and not risk it breaking. As you can see, there are many excellent choices available when it comes to essential oil diffusers. We hope that you’ve found this article helpful and informative, and that you can take the information we’ve provided for you and use it to find the perfect essential oil diffuser for your own household. If you have any advice of your own regarding essential oil diffusers, we’d love to hear from you in the comments section below. Thank you!